As well as its moons, Saturn itself can create “waves” in its rings. Saturn’s rings are one of the most beautiful sights in the solar system. They are an amazing planetary phenomenon – countless bits of rock, ice and dust orbiting the planet in relatively paper-thin rings, which, when seen from above, kind of look like a giant vinyl record (remember those?). Saturn’s many moons can affect the rings’ appearance due to their gravitational pull. 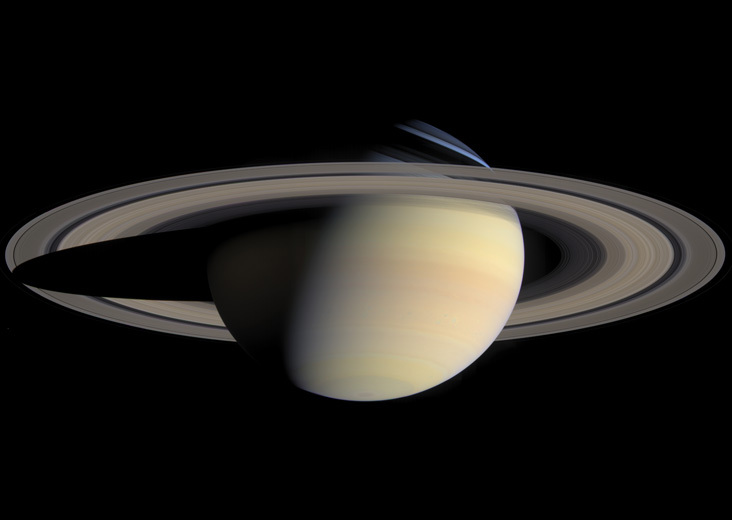 Now, new research shows how Saturn itself can do this also, essentially “shaking” its rings. The gravitational pull from the moons creates “waves” in the rings, a bit like ripples in water. Most of these are in the outer A ring, the main ring closest to the moons. Others, though, are in the C ring, closest to the planet. Since the moons couldn’t cause these waves, being too far away, their formation is now thought to be caused by Saturn itself. Matthew Hedman and Philip Nicholson at Cornell University used data from the Cassini spacecraft to reach their conclusions. As Hedman states, “We found that Saturn probably is affecting the rings just as the moons do.” They were able to map six waves in the C ring in detail, by measuring how starlight from background stars is absorbed in the ring. Basically, as material in Saturn’s interior moves around, it affects the planet’s gravitational field, which in turn creates waves in the rings. The new findings will be published in a future issue of The Astronomical Journal. Also follow The Meridiani Journal on Twitter, Facebook, Google+ and Pinterest to get the latest blog posts and other space news.